A wide beach, the most beautiful in Versilia. 12 km of golden sand enhanced by more than 100 beach resorts that offer more diversified services. In Viareggio, major tourist resort on the Tuscan Riviera with its hinterland dotted with small villages and charming, natural surroundings, Bagno Teresa offers its customers a cozy and well kept structure, with large green spaces you can live in extreme relaxation. Umbrellas and tents spaced over 4 meters between them, sea-water swimming pool, green spaces are served by cabins, to offer guests the utmost comfort. During the day you can have a quick lunch or snacks at the Restaurant Bar. A structure complete with every comfort for those who want to spend a day, or an entire season, in the sun. 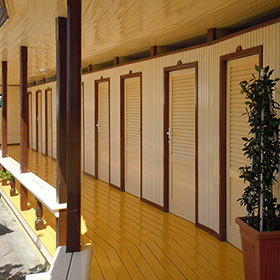 The Beach Club is composed of 50 cabins. Superb views of green meadows and groves follow one another in harmony with the environment creating fresh shaded areas to relax and let children play with a dedicated playground. The lovely waterfall pays tribute to the wonderful nature that surrounds us. No shortage of areas for a picnic lunch, always clean and tidy. In the evening, on request, you can also make use of the BBQ under the stars. The large private car park is home to over 100 cars, access is allowed only to customers with the use of magnetic cards, which provides guests ensuring greater security for their vehicles. The two-wheeled vehicles access through a lovely tree-lined driveway. 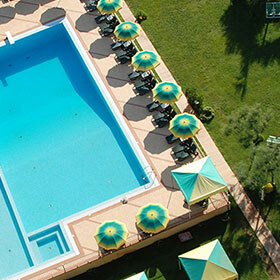 Bagno Teresa has a wonderful salted water pool whose sparkling waters fortify from the harsh summer sun. There is a separate pool for children and a hot tub for adults and is always supervised by qualified lifeguards. The pool of Bagno Teresa is for the exclusive use of our guests: for info on rates schedules courses and so ask at reception. 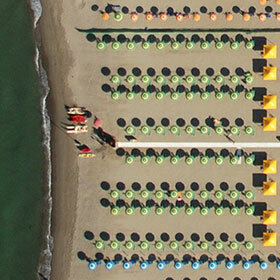 The beach of Bagno Teresa is impeccable! Each day before the opening is sifted by hand (like once) and all the chairs are realigned to provide at all times a neat and clean environment. The arrangement of the beach provides for greater peace of mind, with a minimum distance between umbrellas of four meters: 176 furnished with umbrellas and sun beds and 32 tents furnished with chairs, small director chairs, sun beds and tables. We pay the utmost attention to the protection of safety at sea and across the beach thanks to the continuous presence of patented and specialized lifeguards. On the beach you can find fields for most sports: soccer, volleyball and beach tennis, you can also rent canoes and make surfing courses.